So I'm upgrading my CCT's from stock to Kreiger's. I've got the rear cam cover off so I can see the positioning of the cam lobes to ensure that I'm at TDC when I rotate the engine. The cam lobes are pointing each other, RT mark is in the correct position in the timing hole, however, the RE & RI marks on the cam sprockets are not where they are supposed to be according to everything I've read. They are not completely opposite of each other. 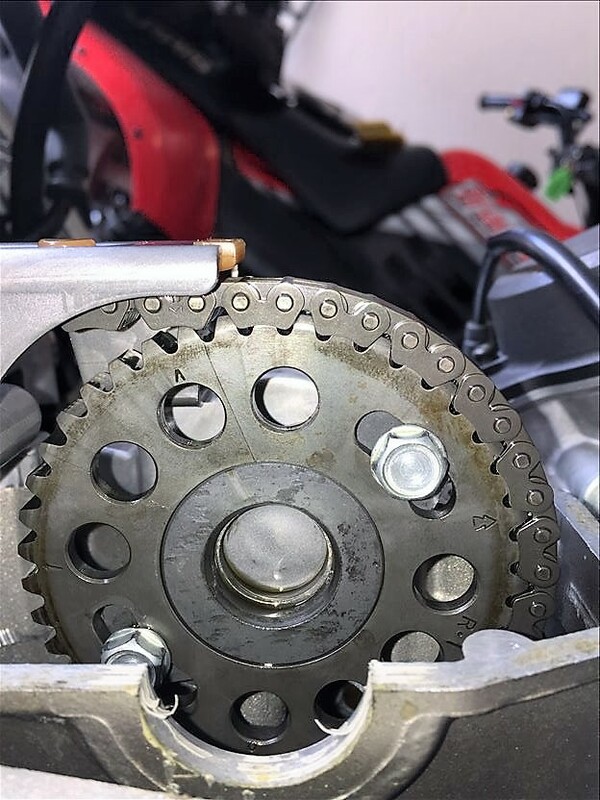 The RI on the right sprocket is about level with the top part of the cylinder head, the RE on the left sprocket is at 12 o'clock position. I've turned the engine counter clockwise numerous times now to see if this positioning will change and it doesn't. To my knowledge this engine hasn't had any cam work performed in the past. I'm the second owner, 1999 model with 7k miles. It runs great so I don't think the timing is off. Is it possible that it's been taken apart in the past and wasn't put back together with the sprocket's in the proper positioning?? Any advice is greatly appreciated!! I've searched the threads and haven't seen anyone else with this exact issue. If you are positive that whichever cylinder you are working on is in fact at TDC, then the cam chain should be slack and you can swap the CCT's. But, if it were my engine, I would really want to know how my cams are timed. Here's a stock cam gear. See the difference? I'll trade you my stock cam gears for your slotted cam gears. Then you don't need to buy a degree wheel and this will put your cam timing back to stock. Only because it's Christmas time, right Crux? And if you're interested in swapping, Xray, you should swap with me. My stock cam gears are way more stock than Crux's stock gears. Last edited by VTR1000F; 12-14-2016 at 07:51 PM. I'm in the giving spirit, what can I say. Haha thanks for the generous offers! I'll hang on to the ones I've got, makes me wonder what else might be aftermarket inside this beast since the cams are. I'm somewhat mechanically inclined, but not enough to play around with cam timing. If I've got RT line showing in the timing hole and the cam lobes are pointing towards each other, shouldn't it then be at TDC in theory? I zip tied my chain to each gear to ensure no skippy. Xray, if you haven't already seen this manual CCT installation guide, it is fantastic with lots of pictures and very detailed to help you along the way. Also, just because you have slotted cam gears doesn't necessarily mean you have aftermarket cams. Those slotted cam gears bolt up to stock cams and aftermarket cams as well. If you are able to, I'd ask the previous owner what he all did with your engine. Last edited by CruxGNZ; 12-15-2016 at 07:36 PM. a) Aftermarket slotted cam gears that have been slightly advanced or retarded timing wise for performance by the last owner. b) My bike is slightly out of time due to still having the stock CCT's and the chain has been able to jump a tooth here and there over the years. 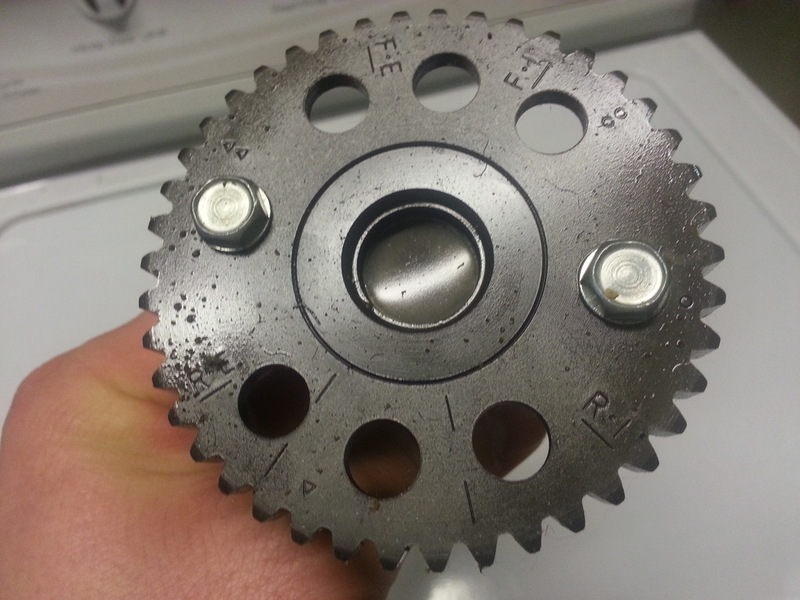 c) When these aftermarket cam gears were installed they paid poor attention to lining up the markings properly. Which I think is the least likely. I really think the timing is set where its supposed to be. It runs like a champ but I think it gets less mpg than the average hawk. Possibly due to altered timing? Or full m4 exhaust w/ k&n and jetted? Or all the above? I'm not able to mess with my bike until Monday or Tuesday due to work, but it's giving me a chance to do all this research till then. All the advice thus far has been super super helpful!!! I really doubt your chain has skipped teeth just because it's auto cct's. The point of adjustable cams is to vary timing... so your marks will not line up for that reason. I'm going to venture to say a bit of time was involved getting them to where they are. Zip tie the chain tight to cams and swap the tensioners. Set proper tension and button her up. it gets less mpg than the average hawk. Possibly due to altered timing? Or full m4 exhaust w/ k&n and jetted? Or all the above? You want killer milage, buy a scooter. The changing process went smoothly, I did the rear CCT first, zip tied for security. Rotated the crank after a few times and pressure felt the same to rotate it, however, there is a little noise now where I can see the cam chain hitting the cam guide plate. I took the plate off after installing CCT to make sure I had 5-7 mm of slack between sprockets while adjusting. I erred on the loose side of 6-7 mm. Repeated same process for front, I took the cam cover off to be able to zip tie and figured I'd check valves too. I've done everything step by step and I didn't hear any clicking sounds while changing them out. Cam sprockets are all in the same alignment as before and cam lobes all still match up the same too. Now when I rotate the crank around it requires a lot less effort to do so than what it did before changing CCT's out. It seems to want to turn on its own while rotating a bit while rotating, and then it will require pressure again. The reason the generator cover is off in the video is because the crank bolt was seized up when I tried to remove and had to chisel it out. I did put the cover on while lining up for TDC to make sure all lined up correctly in the timing hole. It seems to want to turn on its own while rotating a bit while rotating, and then it will require pressure again. Yes. You are compressing a bunch of air and after the piston reaches the top of its stroke, the compressed air is pushing the piston back down creating the movement you are getting. I can't hear the noise you describe. It can be a bit un-nerving, but it seems you did everything right. If you hear a rattle after you start it up, they may need to be a little more snug. I did mine while it ran. Haven't touched them since. First.. remove the plugs so you can rotate the engine with more "feel"
Confirm the procedure... that is both valve covers off, cam timing marks AND cam lobes aligned when the appropriate flywheel timing mark is aligned center of the window. While the chain tightness may be a bit of Grey area, a bit of feel or using a made up (in a good way) slack specification... Cam timing is NOT a Grey area, its not a judgment call, its either spot on or off, no middle ground to "judge"
Cam timing is NOT a Grey area, its not a judgment call, its either spot on or off, no middle ground to "judge"
Well, he does have adjustable cam gears so the marks are not 100% lined up the way everything he reads states they should be. You'll still feel varying pressure as the cam lobes press against the valve springs... the springs will resist the rotation and then assist it as the lobe passes over. Much more noticeable on a v-twin because of the infrequent and uneven firing order. Last edited by 7moore7; 12-21-2016 at 07:12 PM. Ahh, got ya.. "FEEL" is really hard to convey over the Internet. You may be feeling the valves lightly kiss the pistons or just the drag as the cam lobes are opening and then being pushed away as the lobe goes over center. Best I can say is confirm your crank timing marks, check the lobe orientation ..as you have no cam sprocket usable timing marks... your kind of doing an educated guess unless do it the "right" way with a timing wheel. 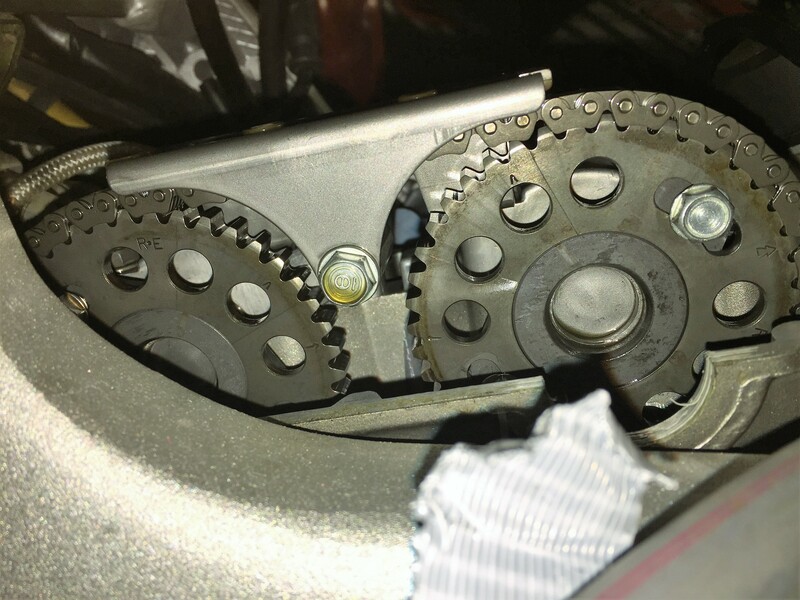 Honestly, if I had a new to me bike and I found adjustable cam sprockets not previously known about, Id not be starting the engine again until I checked cam timing. Out of curiosity more then anything, but to confirm they were set in a safe range as well. Thats easy for me to suggest doing as I have the equipment, time and space... I get that its not an option for many..
Yeah I'm kind of leaning in the direction of bringing it by a local shop with a timing wheel to check it. I think I'll sleep better at night knowing everything is exactly where it is supposed to be, no guessing about it. I reached out to the previous owner and haven't heard back yet. I'm going to venture to say a bit of time was involved getting them to where they are. Think said shop will have the knowledge to confirm you're ok without messing with the adjustable cams? Checking is not messing with. No adjustments need be made, nothing changed to check. Point is, he has an unknown cam timing setup, and with 2 hours of labor, a competent tech can provide him current cam timing and cam profile specs. From there a few paint marks on cam sprockets and he has timing marks to be used for routine services. Actually, the point was... the fact that he may be taking it to a tech who's never seen adjustable cams. Right, I get that, then you mentioned "messing with it"
You don't "messing with the adjustable cams? " to CHECK timing. The tech will not be changing, adjusting or removing any part of the valve train to CHECK timing and lift. Any semi competent shop with a tech that knowns how to use a timing wheel can CHECK the timing and lift, and confirm what cams are in it.. The procedure is as safe and non invasive as the owner turning it over by hand or running the motor, both of which have already been done with those cams. If we were talking about ADJUSTING the cams id have the same concern as you... but putting a timing wheel on the crank end, and a dial indicator on the valve train is not "messing" with anything, not adjusting, heck the only thing loosened is covers and caps, plus the flywheel bolt. I absolutely agree if he can find a Roger Ditchfield, Ron Hamp, or some other world renowned builder local ..do it.... But we are talking very basic service here.. you do not need that level of expertise to check cam timing. I'll leave it here.....to each his own....perhaps my opinion is based on I don't have others work or build my motors, and the folks I work with or around are quality techs.. I just don't have those personal experiences of having bikes worked on by hacks....So i forget according to the INTERNET and lots of first hand reports right here, Dealers are stealer's, most all doing wrenching in shops are monkeys with wrenches and should never be trusted. I am offended, that appears to be a high capacity Assault stick...I have been trigged and not must retreat to my safe space with crayons and stuffed bears. 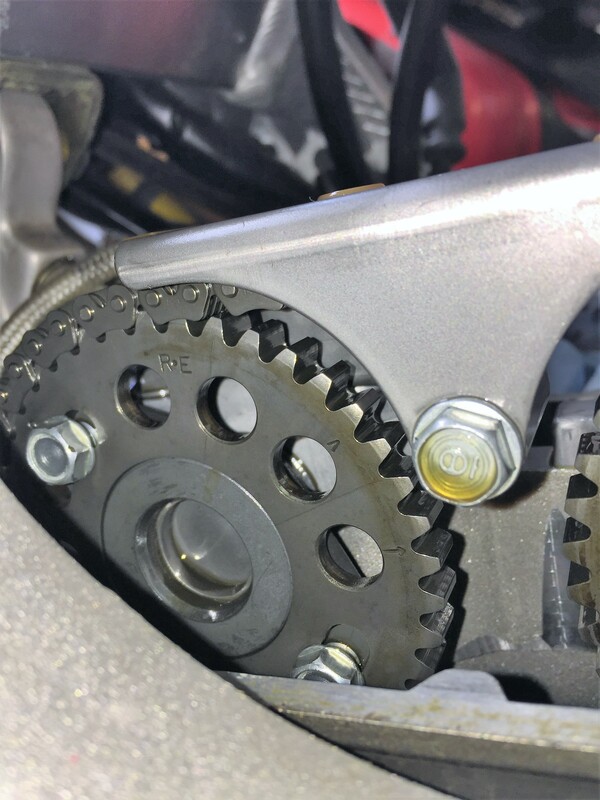 Quick Reply: CCT upgrade, cam sprocket position?? ?